An excellent getaway for everyone! Boogaloo is a 3-bedroom holiday house located in a quiet street in Surf Beach, fully furnished and ready for your holiday! Perfect for a group of six people. We are really set up for family holidays / small group getaways / weekends away. Boogaloo Beach House is NOT the kind of party house accommodation for end of year celebrations. Beach activities, nature walks, local area exploration and relaxation. A short walk to the beach and the convenience of the local shops. There are two double bedrooms with built in wardrobes and the third bedroom contains a set of single bunks and a mini (kid size) sofa bed. Doonas, pillows and extra blankets are supplied. LINEN IS NOT SUPPLIED, please come prepared! The open plan living area is furnished with two leather lounges, television with DVD player/stereo system with USB connection. There is a wide selection of movies for all ages to veg out to. In the kitchen you will find everything you need to prepare and serve your holiday meals without having to leave the house. With a new fridge and lots of bench space the stylish kitchen opens onto the living area. There is a plentiful supply of crockery, glasses and utensils for 6 guests. The bathroom contains a clawfoot bath with shower overhead. Catch the morning sun whilst enjoying your breakfast on the full-length front verandah. The huge back deck has an undercover area with gas B.B.Q and is great for entertaining. Timber dining table and benches for outdoor dining. Beautiful garden setting to kickback and relax with an outside shower to wash off the sand when you return from the beach. The garage/games room is equipped with ping-pong table for fun filled tournaments! Enjoy the breeze through the house - we do have fans but no air con. Hand wash dishes in the sink....take it easy! Boogaloo Beach House is just a short 500m stroll through the reserve to get to the sand and sea at Surf Beach. A great beach for swimming, body surfing and boogie boarding. It is patrolled during the summer holidays and also has a surf school with beginner lessons operating during this time. There is a kiosk with takeaway food and picnic area with BBQ facilities. Outdoor showers, toilets and parking. Denhams Beach and Wimbie Beach are also walking distance around the headlands from Surf Beach. Fishing and boating: bring your own gear or go on a river, bay or deep-sea outing. Jet skiing and scuba diving: local companies specialise in these activities. Birdland Animal Park: many species of animals, birds and reptiles. Monague Island: home to seals, dolphins and turtles. You can take a charter boat for a day trip. Pebbly Beach: large resident kangaroo and native bird population. Great for photo opportunities! Mogo: a cute village shopping strip with all sorts of unique and hand crafted items, galleries, antiques and cafes. Mogo Zoo: is the renowned home to many exotic, endangered and rare animals. Tilba Tilba: Historic village with cafes and great local cheese making. Beautiful countryside. On first impressions when we arrived we were a little disappointed as the home is much older than appears in the photos on line however it does say that Boogaloo is an OLD Beach Shack and that is exactly what she is! Once we had settled in and given the place a bit of a once over tidy up we loved it. My main criticism would be the lack of fly screens on the doors to keep the fly’s and mozzies out at night but we found and made good use of the mozzie coils. One other criticism and not really a critism more a comment but we found the the shower over the bath was not ideal for my husband with his dodgy knee and my self with a dodgy hip we found it very awkward to get in and out of, not sure what the solution would be here. Plenty of books and games supplied to play which was fun at night instead of watching the cricket on the telly. Location is fantastic very close to great beaches. Fantastic secure yard for our furrbaby it was wonderful to be able to take her away with us. Tomikin beach (a 24/7 dog off leash beach) was only 12-15 drive away, we had a lot of fun there. Other beaches seemed to be on a time share basis so dog friendly between 5pm - 9am which works really well for everyone. Overall had a wonderful time here. The property was adequate and in a great location. However it was very dated, dirty with no air-conditioning, no fly screens on doors and the ones there had holes. The main door kept jamming too. It really felt like no care and no love has been put into the house for a long time. We would not likely be returning to this house. 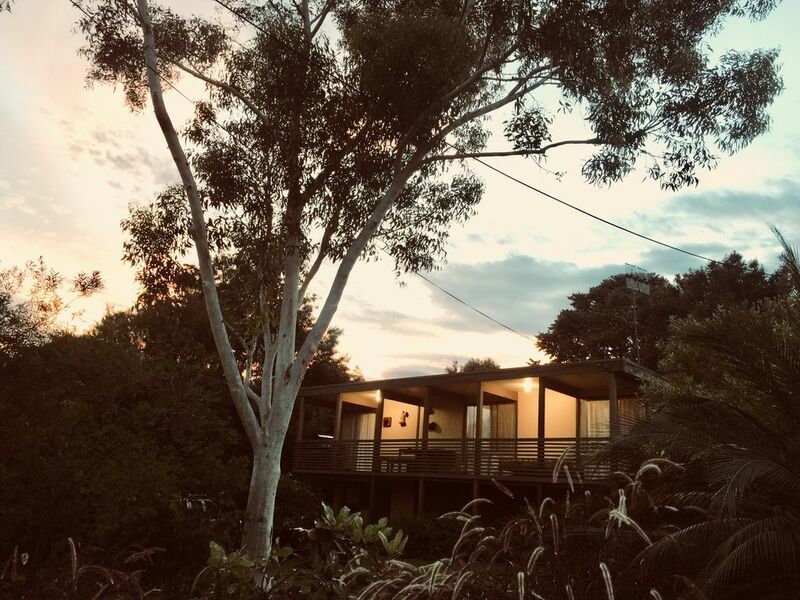 This is a retro 60’s family holiday home - not not a five star resort and not advertised with air-conditioning though we do have fans for those hot nights. Perfect getaway in a cosy house. A great set up for family and pets - fully fenced yard was perfect. Loads of activities and the beach is close by. An older style home perfect for a getaway. Nice basic little home. The outdoor areas were nice.The house was well equipped, BBQ, cooking and cleaning equipment, entertainment system, books, games - everything you need for a relaxing holiday. As we are taller people, 6'2, the double beds, not queen, were a always going to be a bit short. We had a fantastic stay at Boogaloo. A lovely small beach house, clean and tidy, had all the amenities we could ask for. The kids loved playing the games and there were plenty of DVD's for the rainy day we had. The back yard is a great size and being fully fenced we weren't concerned about the kids running around and having fun. The deck is huge and the large outdoor table was perfect for sitting around in the fading evening light. We don't have pets but it would be excellent for families or couples that do. The location is great - easy walking distance to the beach and local shops.